TERMINAL was the final major Allied wartime diplomatic conference, held in Potsdam on 17 July-2 August 1945. The conference was primarily concerned with the fate of postwar Europe, but was also the occasion of the Potsdam Declaration outlining the surrender terms for Japan. The Potsdam Declaration was not joined by Stalin, since Russia still maintained its neutrality in the Far East, but it was joined by Chiang Kai-shek, who did not attend the conference but cabled his approval. 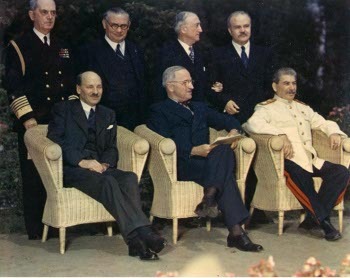 Smith (1985) has concluded that Truman was anxious enough for Russian intervention at the time of the conference that he did not press Stalin on the issue of Poland. However, Stalin pledged to negotiate a treaty of friendship and alliance with China, which the Western leaders understood to mean the Kuomintang.